By now, I’m sure most everyone has finalized their Thanksgiving menus, but I couldn’t let the holiday pass without sharing this little gem. Of course, this dish doesn’t have to be limited to the Thanksgiving feast- it’s fantastic anytime during the cold months. 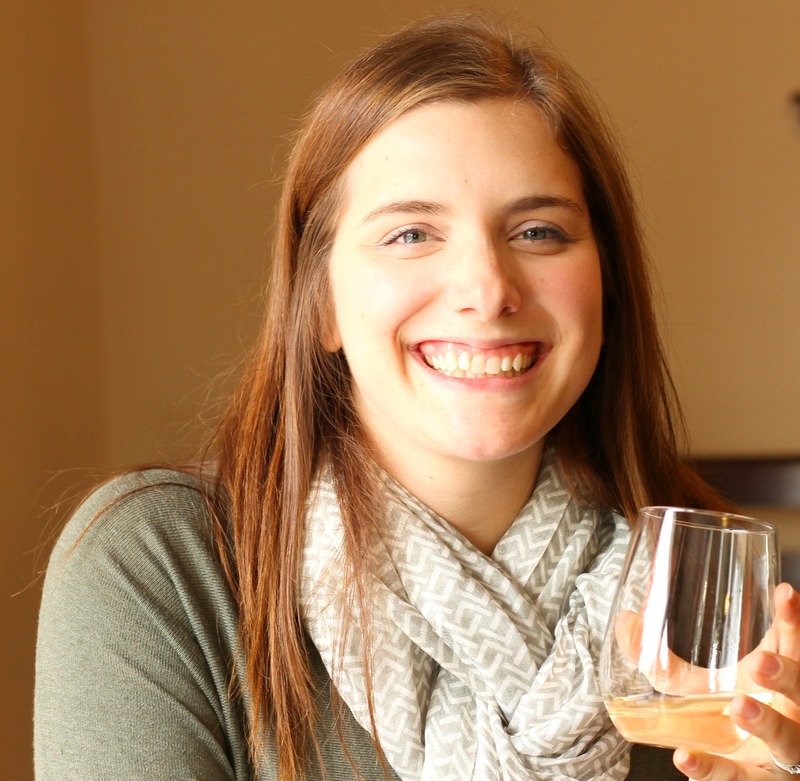 But, if you DO add it to your Thanksgiving repertoire, it will not go unnoticed. “Green bean casserole? Pffft, yeah right. More like creamy mixed greens with pecans!” I know it’s not traditional, but it works so damn well with turkey and stuffing and cranberries. It’s begging to be tradition from here on out. This weekend, I went to visit my youngest sister, my brother-in-law, and my nephew. They just bought their first home, and I had to go snoop around their new digs. Also, it’s such a bummer, but they won’t be making it to Thanksgiving this year thanks to the Navy (I give you the middle finger salute Navy). So, I made them these creamy mixed greens that they can have at their Thanksgiving for three. They each sampled a bowl of greens and gave me the thumbs up (and not the middle finger salute, thank goodness). Isn’t my sister loverly? Remember my love affair with pecans? It’s still going strong. We’re very happy together, and so that’s why they’re included in this recipe. Wanna diss pecans and use another nut? Whatever makes you happy on this lovely holiday. I won’t judge. Yes I will. I just won’t tell you I’m judging you. 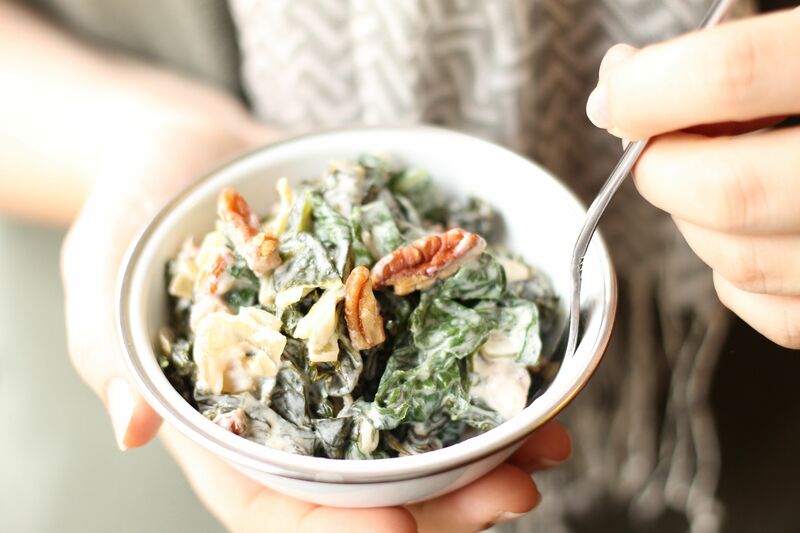 Be bold, be daring, and try these greens with your Giving Thanks meal. You’ll be thankful you did. And so will your friends and family. Another reason to be thankful? You can make this a day ahead. “Oh, thank goodness.” Thanks thanks double thanks. Heat the largest pot you own over medium-high heat. Add the kale, wine, and salt. 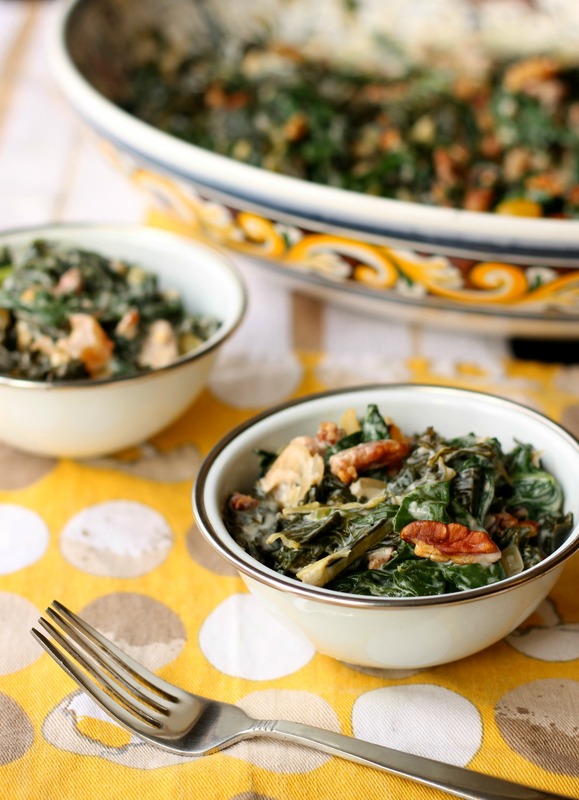 If you’re using a thick-leafed green such a collard greens, add it to the pot with the kale. If it’s something more delicate such as mustard greens, wait to add it to the pot with the swiss chard. Stir the greens around until wilted, and then cover, reduce heat to medium, and cook for about 10 minutes, until the leaves are tender. 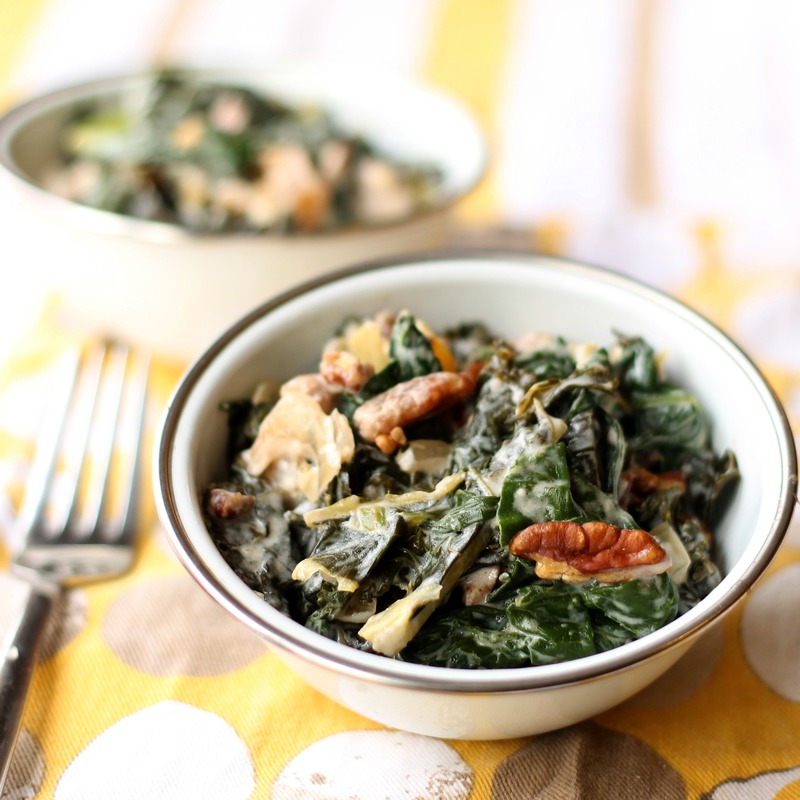 Add the swiss chard and other delicate greens if you’re using them. Turn in the pot until wilted, about 3-5 minutes. Put the cooked greens in a bowl. Return the pot to medium-high heat, and melt 4 tbsp butter. Add the swiss chard stems, onion, and garlic. Saute for 3-5 minutes until the onion is softened. Add to the bowl with the greens.